Image caption Emmanuel and Antan Edet, from Perivale, north west London, deny slavery and cruelty charges. A doctor and his nurse wife have been found guilty of keeping a man as a slave for 24 years at their home. Ofonime Sunday Inuk, now 40, told Harrow Crown Court he arrived in the UK from Nigeria in 1989 when he was 14 and made to look after the couple's home and children. 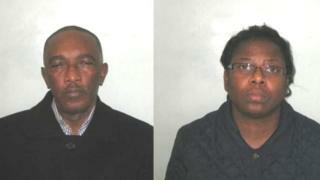 Emmanuel and Antan Edet, from Perivale, north west London, were found guilty of three slavery and cruelty charges. The couple, who had denied the charges, are due to be sentenced on 18 November. During the case, Mr Inuk told the court he had been promised an English education, but was instead made to work, with the warning that if he left the house or went to the police he would be arrested for being an illegal immigrant. The court heard he had made attempts to escape and spoke to the police in 2005, but was left "a bit dejected" after being told by an officer it was a "family matter". Ten years later he contacted the Metropolitan Police again when he saw media reports about modern slavery and realised the life he was being made to lead was wrong. He also emailed the charity Hope for Justice, which in turn contacted Scotland Yard to co-ordinate his release. Prosecutor Damaris Lakin told the court: "Emanuel and Antan Edet have cruelly robbed this victim of 24 years of his life. They have treated him with complete contempt. "Not only did the defendants have total psychological control over the victim, but they also had control of his passport and identity documents. "This was a shocking case of modern day slavery which has no place in our society." The couple were found guilty of child cruelty, slavery and assisting unlawful immigration. Det Ch Insp Phil Brewer said: "They controlled what he wore, what he did and how he spoke for the majority of his life. "Today, the victim is living a new life in the UK. He has a job, a home with his own bed and freedom to move, and he is studying." Edet, 60, is a trained obstetrician and gynaecologist and his wife has worked as a senior sister at a hospital. Ben Cooley, from Hope for Justice, said the victim's story was "saddening" but "unfortunately, not surprising" and the charity had liberated more than 70 slaves since January. He said: "To all those others still out there I say, please have the confidence to come forward, we will do all that we can to help you."